If you have read the recent Indian Ecommerce growth report, one thing stands out quite distinctly. Indians now increasingly prefer shopping on their mobiles. According to the report, By 2016, mobile shopping is expected to grow a whopping 27 times compared to 2012 levels and nearly 3.5 times that of 2013. 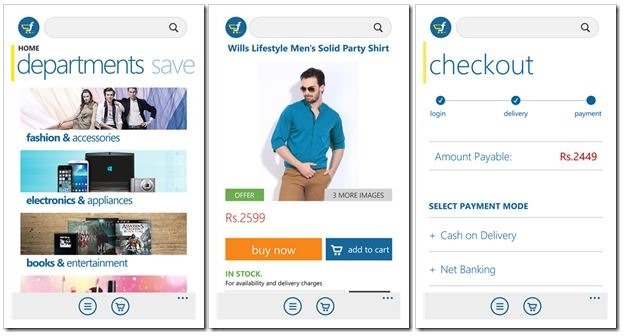 Flipkart understands that – They probably had one of the best mobile shopping app for Android & iOS devices in India. Now, they have gone ahead and launched mobile app for Windows phone users as well. While we could not test out due to lack of Windows phone at our end, the screenshots do show that the app is quite well made, intuitive and easy to use for everyone. It is quite interesting that Flipkart has launched it, as Windows phone penetration in India is still very low. Also, Nokia who have been releasing smartphones only on Windows platform since their Microsoft takeover, have recently released Nokia X, which is based on an Android fork. What I would have liked to see was Flipkart’s app on on Windows 8 Desktop version, which would have been quite interesting. If you have a Windows phone, give Flipkart app a spin and let us know what you think!